2014 was a hugely transformative year for us at The Philosopher’s Stoneground. We moved our business from Davis to Berkeley, we purchased a company van that runs on 100% local biodiesel from waste vegetable oil, we bought another business, Ostara Foods, whose stone ground coconut butter and Cocotella (chocolate coconut butter) products we are now producing and selling to Whole Foods Northern California, and we met our Permaculture hero Mark Shepard and got him and his team interested in designing our regenerative almond orchard…! Below we share some of our favorite moments from the year. Thanks for making it great with us! We look forward to collaborating with you to bring more awesomeness to fruition in 2015. San Francisco Green Fest 2014! If only the world were this way! Who killed the electric car…? First fuel up with locally made biodiesel from waste vegetable oil in Sebastopol, California! October 16th. 11/11 Celebration: 100 free passes to San Francisco Green Festival! Happy 11/11! Only two days left to take advantage of 100 free tickets we’re giving away to the San Francisco Green Festival. This is going to be our biggest show of the year! Hope to see you there. Offer ends at 5pm Thursday, Nov. 13th. Yesterday, after an awesome concert by Rising Appalachia at Impact HUB Oakland, I was reminded of the importance of fueling the good food movement with good music! Tonight, we have the opportunity to experience another conscious musician, The Polish Ambassador, in San Francisco. He is on a Permaculture Action Tour, where they are playing a show in a city at night then leading a community garden or other Permaculture planting project the next morning. We are inspired by this novel rocking way to regenerate the Earth, so we decided to feed the movement! Tomorrow morning, we will bring samples of sprouted almond butter line, including our latest creation: fermented sprouted almond butter! Read the Facebook event page for details. We will also have our new lines of stone ground coconut butter and chocolate coconut butter called Cocotella to nourish those performing the Great Work of nourishing the Earth at Gill Tract in Albany. If anyone is able to bring bread, crackers, apples, etc onto which we can spread the products we’re sharing, that would be much appreciated. See you tomorrow! We are grateful to announce the big news of our company: we just purchased Ostara Foods, who produces the finest stone ground coconut butter and chocolate coconut butter available on the market! Our coconut butter is stone ground for over 24 hours to create a silky smooth texture. No more dry, chalky textures that plague the other brands of coconut butter! Cocotella is our chocolate coconut butter, which features the same dreamy coconut base with added cacao and coconut sugar. We are honored to bring these products into the fold of our company. They are perfectly aligned with our Nourishing the Roots business model, as we are now aiming to create a network of coconut and cacao orchards in the tropics to directly source the ingredients for these products. Like Almondia, but in a different biome! Visit the Ostara Foods website to see the current list of stores, which includes 26 Whole Foods in Northern California. Ostara products are also available online through Synchro. September events: National Heirloom Expo in Santa Rosa and Eat Real Festival in Oakland! Greetings, friends! We’ve been hard at work preparing the next stage of our company, which we are excited to announce shortly. In the meantime, we want to let you know that we are honored to be exhibiting at two amazing events coming up in September: the National Heirloom Expo in Santa Rosa (Sept 9 – 11) and Eat Real Festival in Oakland (Sept 19-21)! 1) This will be our second year at the National Heirloom Expo in Santa Rosa (Sept 9 – 11) . Last year, it was our busiest event of the year and resulted in many amazing connections for people that our helping us move our work forward! Tickets are only $10 a day or $25 for all three days. More than worth the wealth of information, connections, resources, and great food! 2) This will be our first year at the Eat Real Festival in Oakland (Sept 19-21) and we don’t know what to expect other than a crowd of 100,000+ people hungry for real food! This festival is FREE, so we look forward to seeing you there! My name is Tim and I am the Chief Philosopher and Nut Alchemist of The Philosopher’s Stoneground. We are a young sprouted almond butter company. When I was in high school, someone told me that with a degree in Philosophy, you can either flip burgers or write books. I didn’t heed their warning. Now, I sprout almonds, sell my philosophy in a jar, and volunteer to read people stories about it. I will start by reading you a story that has become true over the past year. Deep in the midst of an existential crisis concerning my life’s direction last year, on April 17th I received a detailed vision that it is my life’s work at this time to create a sprouted nut butter company. This company would educate people on the importance of sprouted food and raise funds for an ecological orchard to show a different way forward for almond agriculture. Davis is where I started my business last year on Earth Day, smack dab in the heart of the Central Valley where 85% of the world’s almonds are grown. My house became the first certified Cottage Food Operation in Yolo County thanks to the California Homemade Food Act. Within two months, I outgrew the confines of our home kitchen and moved into the back of a local restaurant, where I operated with the help of two employees for nine months before outgrowing that, too. In May, we moved to Oakland to take our business to the next level! We now have a co-packer in San Mateo so we can focus on sales, distribution, and philosophizing. Sprouting is a traditional way of preparing nuts and seeds by soaking them in salt water. This germinates the seeds, which makes them sweeter, more digestible, and more nutritious. Next, we dehydrate the almonds, then stone grind them into butter. Our products are sold in 18 regional stores as well as online through Good Eggs, Real Food Bay Area, Albert and Eve Organics, and Three Stone Hearth. We sell at the Montclair Farmer’s Market, where you can buy or gift our product using the awesome Credibles service. We are in the business of intelligent nourishment: spreading consciousness and nourishing all Life through delicious food designed for human consumption. We accomplish this by creating foods that are grown, produced, distributed, and consumed in a holistically healthy fashion for all places and organisms involved. We are a big-picture company focused on facilitating the regeneration and flourishing of Life on Earth. Allow me to take you into the visionary realm of The Philosopher’s Stoneground. Perhaps I will tell you in five years that the following story has become true. Knowing that a food product relies on good farms to produce raw ingredients, we invested in land and created a drought-tolerant ecological orchard. The first site was called Almondia. By vertically integrating Almondia into our company, we not only began to truly accomplish our goal of regenerative agriculture, but also secured the price of our ingredients in an otherwise volatile market. We brought the wisdom of nature into the design of our farming ecosystem. From a look at history, we saw that nearly every culture which was based on annual agriculture failed. With this in mind, we chose perennial tree crops such as oak and chestnut as the keystone species, followed underneath by almond, walnut, pecan, and hazelnut trees. Below that, we planted native berry shrubs, vegetables, and herbs. In between these three-dimensional rows, we planted perennial grasses and industrial hemp as our alley crop, which finally became legal again in 2014 and started a second industrial revolution. Integrating holistically managed animals and insects further boosted the vibrancy of Life in the orchard. To bring indigenous cultural wisdom back to the mainstream food system, we re-introduced and popularized sprouting as a form of processing all grains, nuts, seeds, and beans. We grow a variety of staple food crops that we process into a diverse cutting-edge product line, including gluten-free acorn and chestnut flours, sprouted nut butters, and the traditional animal and vegetable farm yields. Vertical integration of our manufacturing facility cut costs and carbon pollution. The manufacturing of our food happens on the orchard in a certified living building that biomimics the model of a flower in its design. Kitchen workers enjoy plenty of natural sunlight and views of the abundant orchard outside. We distribute using trucks powered by the hemp biodiesel we grow and process onsite. Our tractor bodies are made of and fueled by plastic from this hemp. The roads and buildings on site are made of hempcrete. With full vertical integration of our company, we became sure that we were holistically and effectively promoting the regeneration and flourishing of life on Earth. As Life thrives, carbon is cut, and profits blossom. Excess profits finance the expansion of our regenerative network of cultivation, manufacturing, and distribution. Our non-profit educates people about our open-source business model called “Nourishing the Roots” to encourage its worldwide spread. Thank you for listening to my two stories. Please talk to me if you want to help make the second story come true! 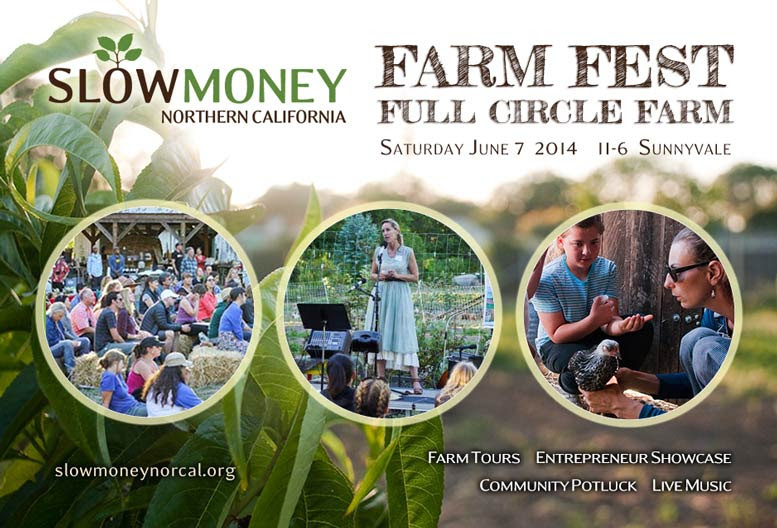 We’re Presenting at Slow Money Farm Fest this Saturday! Farm Tour, Entrepreneur Showcase, Community Potluck, Live Music, and lots of conversations and networking! The Entrepreneur Showcase is always a highlight at Slow Money Farm Fests. Local businesses present their contributions to our food system and the plans for growth.The 10 presenters for the June 7 Farm Fest are listed in the agenda below. We received over 70 applications. The choices were hard. You will enjoy this showcase! The Philosopher’s Stoneground now based in Oakland! As of Friday, we are happy to be the newest registered business in the city of Oakland! We moved here from Davis in order to take our business to the next level and join the vibrant network of artisanal food producers creating an awesome local food system here in the East Bay Area of Northern California. We are starting strong with our membership at Impact HUB Oakland, vending at and attending the Business Alliance for Local Living Economy’s annual conference from June 11-13th, and becoming a member of the Sustainable Business Alliance! Looking forward to collaborating with all the social and environmental entrepreneurs here to change the way food is grown, made, and distributed. Earth Day is every day, but our one-year anniversary is only today! We are excited to celebrate one year in the business of Intelligent Nourishment! A year ago today, I sent out messages to several listservs in Davis announcing the availability of my sprouted almond butter for purchase. With that, the seed of The Philosopher’s Stoneground was sprouted! At that time, I was producing out of my home kitchen using a Vita Mix blender. It wouldn’t be until June 1 when I got the stone grinder and dreamed up the name for the company. I operated this tiny two-pound grinder through several thousand dollars in sales over the course of two and a half months until it became ridiculous and we finally received our larger grinder! Since then, we have been more able to keep up with demand, though our production capacity is still behind our demand. I moved out of the home kitchen and into a commercial kitchen at the end of June. We just finished our time in that kitchen and are now re-locating our operation to the Bay Area starting on May 1st! I am excited for the next year in business and can’t imagine how far it will take us compared to the rapid growth and transformation we’ve experienced this year. The adventure is sure to be incredible! I am grateful to be supported in our mission and vision by our great community of fans and friends. I am equally grateful to the Earth for being the host to all of the lovely activities that we enjoy! Here’s to another great trip around the sun seeing that The Great Work is done.